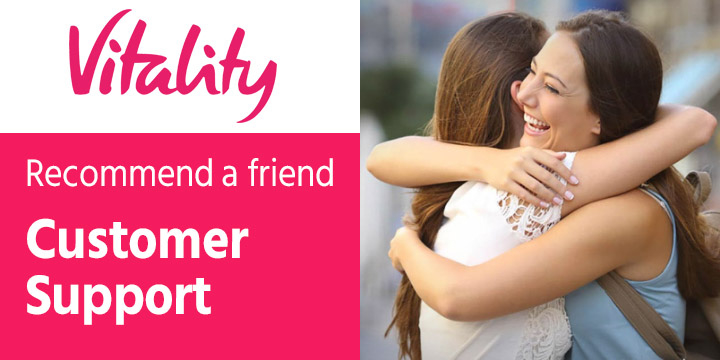 The following terms and conditions refer specifically to the VitalityHealth Recommend a friend promotion. You can also look at the Frequently asked questions for this promotion. If you can't find an answer to your question, you can raise an enquiry with our customer support team. “Our”/ “We” / “Us” means Vitality Health Limited trading as VitalityHealth. The “Promotion” means the Recommend a friend promotion which these Terms and Conditions specifically apply to. All existing VitalityHealth planholders who recommend a new member directly to VitalityHealth (“Referring Members”) shall be eligible to receive either one (1) John Lewis gift card or one (1) Amazon gift card to the value of £100 (Pounds Sterling), per new individual member who purchases a VitalityHealth Personal Healthcare Plan either at vitality.co.uk or directly from VitalityHealth by phone between 22 March – 30 April 2019 inclusive. Referrals made before 22 March 2019 are eligible for our standard £50 John Lewis offer only. For the avoidance of doubt, the definition of a Referring Member does not include any person that has made a recommendation in their capacity as a professional broker, authorised representative or insurance intermediary. All new Referred Members who have registered for this promotion following a recommendation from a Referring Member, and who subsequently purchase a VitalityHealth Personal Healthcare Plan between 22 March – 30 April 2019 inclusive, either at vitality.co.uk or directly from VitalityHealth by phone, shall also be eligible to receive either one (1) John Lewis or one (1) Amazon gift card to the value of £100 (Pounds Sterling). Referrals made before 22 March 2019 are eligible for our standard £50 John Lewis offer only. This offer does not apply to existing VitalityHealth planholders adding new members to an existing VitalityHealth plan. The Referring Member and Referred Member must both provide a valid, active email address. We cannot be held responsible for an invalid email address or other problems relating to the delays to the delivery of or non-receipt of emails, including the effect of spam filters. The Referring Member confirms that they have received the consent of the Referred Member to pass the Referred Member’s contact details to VitalityHealth for the purposes of this offer. 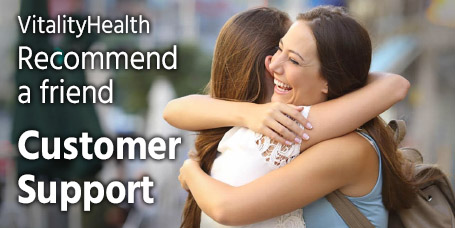 In the event the Referring Member has not gained the Referred Member’s consent, the Referring Member will not be eligible to receive a gift card and shall be liable for any claim made by the Referred Member against VitalityHealth. The Referred Member must register for the Promotion before they take out their plan. They can register either through the online channel where they received the recommendation or by calling Vitality on 0800 779955 and providing the unique short referral code (up to 5 digits) given to them by the Referring Member. If the Referred Member takes out a VitalityHealth plan through the online channel, they must stay on the same device (i.e. PC or phone) during the application process so the recommendation can be tracked. If the referred member takes out a plan through an intermediary, the gift card offer will be void. All transactions must be validated by Us before the Reward can be issued. Once the Referred Member's VitalityHealth plan has been live for three months, they and the Referring Member will become eligible for their rewards. The gift card will not be issued to either the Referring or the Referred Members should either cancel or suspend their VitalityHealth plan within three months of the inception date of the Referred Member’s VitalityHealth plan. When the Referring Member and Referred Member are eligible for their rewards, they will both receive an email asking them to visit a reward claim web page. On that page, they can choose to receive either a £50 John Lewis e-voucher online (an email with a link to a PDF) if they joined before 21 March 2019 or a £100 John Lewis e-voucher or a £100 Amazon e-voucher online (an email with a link to a PDF) if they joined between 22 March – 30 April 2019 inclusive. The gift card is not transferable, non-exchangeable and cannot be redeemed for cash. We reserve the right to substitute the John Lewis or Amazon gift card with another gift card of similar value, in the event the John Lewis or Amazon gift card is unavailable due to circumstances beyond our reasonable control. The John Lewis vouchers shall be redeemable in accordance with John Lewis' terms and conditions: www.johnlewis.com/gift-card. The Amazon voucher shall be redeemable in accordance with Amazon’s terms and conditions: https://www.amazon.co.uk/Giftcards-Giftvouchers-Vouchers-Birthday-Gifts . Amazon.co.uk is not a sponsor of this promotion. Amazon.co.uk Gift Cards (“GCs”) may be redeemed on the Amazon.co.uk website towards the purchase of eligible products listed in our online catalogue and sold by Amazon.co.uk or any other seller selling through Amazon.co.uk. GCs cannot be reloaded, resold, transferred for value, redeemed for cash or applied to any other account. Amazon.co.uk is not responsible if a GC is lost, stolen, destroyed or used without permission. See www.amazon.co.uk/gc-legal for complete terms and conditions. GCs are issued by Amazon EU S.à r.l. All Amazon ®, ™ & © are IP of Amazon.com, Inc. or its affiliates. We are unable to respond to queries about non-receipt of the reward until 120 days after the Referred Member’s plan start date. If you have any queries with regard to the reward and/or this Promotion, please contact the rewards customer services team using the enquiry form. Please note this Promotion is being monitored. We reserve the right to suspend or cancel transactions suspected of being fraudulent and such customers may have their details passed to the relevant authorities for further investigation. If you believe you are eligible for a reward but have not received one, We will investigate your claim provided We receive your enquiry within 60 days of the Promotion closure date. In this case it may take longer to issue you with a reward. We accept no liability for lost entries and no responsibility for difficulties experienced in submitting an entry to this Promotion, including any technical, hardware or software failures of any kind or lost or unavailable network connections which may limit or prohibit an ability to participate in the Promotion. To the maximum extent permitted by law, We accept no liability for any loss, damage and/or personal injury suffered by participating in this Promotion and/or arising out of the enjoyment of the reward. Each Referring Member/Referred Member pair can only receive their respective rewards once. This Promotion is not available for use in conjunction with any other promotion. We reserve the right to alter, amend or terminate the Promotion at any stage without prior notice. This Promotion is administered by Optimise Media (UK) Limited on behalf of VitalityHealth. VitalityHealth is a trading name of Vitality Health Limited and Vitality Corporate Services Limited. Vitality Health Limited, registration number 05051253 is the insurer that underwrites this insurance plan. Vitality Corporate Services Limited, registration number 05933141 acts as an agent of Vitality Health Limited and arranges and provides administration on insurance plans underwritten by Vitality Health Limited. Registered office at 3 More London Riverside, London, SE1 2AQ. Registered in England and Wales. Vitality Corporate Services Limited is authorised and regulated by the Financial Conduct Authority. Vitality Health Limited is authorised by the Prudential Regulation Authority and is regulated by the Financial Conduct Authority and the Prudential Regulation Authority.